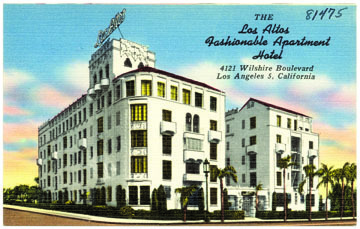 POSTCARD from the early 1940s, approximate, shows the “Los Altos Fashionable Apartment Hotel” at 4121 Wilshire Blvd. Work to include robust preservation planning in all new community plans, starting with the Hollywood Community Plan in 2018. The stakes are high; plans define the future work of city staff for decades. Right now, the findings of SurveyLA have yet to be incorporated firmly into the planning process. The 2018 conversations regarding the Hollywood Community Plan will define the city’s approach to the revitalization of historic Hollywood Blvd. and its immediate environs, as well as historic neighborhoods and adjacent commercial corridors. Access to mass transit is a major driver of these plans, as anyone who has followed development on the Red, Purple and Exposition lines knows. The fate of historic Wilshire Blvd. icons may be next. The discussion needs to include looking at all identified Historic Preservation Overlay Zones (HPOZs) to find a way to help advocates and city staff work together to streamline the process of adoption before it is too late. The number of qualified contributors is finite. If too many are lost to demolition or inappropriate alteration, an entire district is lost. Other zoning mechanisms may help these neighborhoods as well, but only HPOZ guidelines and procedures concentrate on preservation of an entire district to retain not just character but the historic fabric of these historic enclaves. Access to neighborhood-serving retail and appropriate scale of adjacent multi-family housing are current topics of concern in several HPOZs, including Sunset Square and Spaulding Square. Get creative about using historic buildings for housing, probably the number-one priority in the city today for all income levels. Can we put second units on some properties without disrupting neighborhoods? Use industrial buildings to create shared housing? Protect existing historic apartments from being torn down? Support the organizations whose mission it is to preserve and protect: the Los Angeles Conservancy, Windsor Square-Hancock Park Historical Society, Hollywood Heritage, and The Ebell Club of Los Angeles, among others. Wilshire Blvd. and other area churches, the stewards of the historic Farmers Market, businesses or institutions located in historic buildings all need support as well. Did you know that Paramount Studios and the USC campus have identified historic districts as parts of their approved master plans? Get the stories of the built environment out there. Places were built for people. The contexts of SurveyLA have laid the groundwork for the stories of the contributions of women, ethnic groups, industries, and institutions to be told. Even designated buildings can have their stories amplified to reflect events of note that may have been researched since the original designation. Women’s organizations like the Friday Morning Club, sorority houses, The Ebell, and the YWCA (Studio Club) are increasing their profiles by acknowledging their roots and their educational and philanthropic activities. On a personal note, does your family know your story? How did you come to be in Los Angeles? When? What are your personal landmarks, and what role did they play in your childhood education, experience of the city and personal growth? I’m always looking for places to profile and stories to tell. Send me your suggestions in the new year at christy@christymcavoy.com. By Christy Johnson McAvoy, a former president both of the Los Angeles Conservancy and the California Preservation Foundation, as well as an Advisor to the National Trust for Historic Preservation, founded Historic Resources Group in Hollywood.